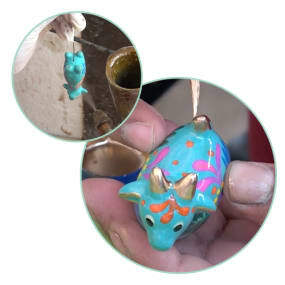 Ceramic Confetti Goat Comes to Life! Hi there! I am Capo the goat, though it is really Edwin who deserves my name! 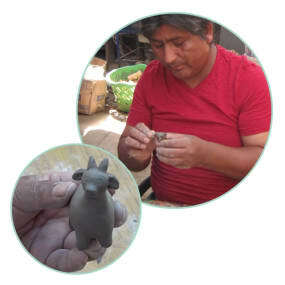 You see, Peruvians enjoy calling those with extra talent “capos.” And Edwin sure is one of those, as he has been mastering his art and working with clay for over 30 years. 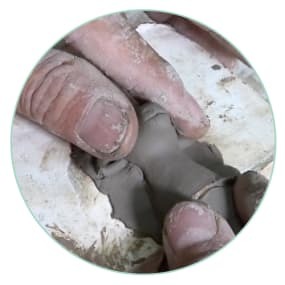 Once Edwin got a clear picture in his mind of how he wanted me, he grabbed a chunk of clay and worked and worked until I was shaped just right. Then, he fine-tuned my form with simple wooden tools until he was happy. He even gave me eyes to see! At this point, I’m considered his “prototype,” which means that I am ready to help him create a mold to shape my little brothers and sisters. First, I am dipped in soap so I won’t be sticky. As Edwin makes the plaster mold, I stay super still so I don’t create any weird lumps or bumps. I have to practice patience because, depending on the weather, it can take two to three hours for each of the three parts of the mold to dry! 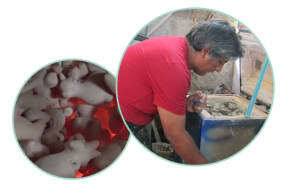 When the mold is ready, Edwin and his helpers press soft clay into each piece and pound the molds together to fuse all of our parts. Being headless doesn’t sound very fun! This only takes two minutes per goat. But then we all have to wait on the shelf for a day because our bodies are really soft. Any pressure could make us all wobbly. By the next day, our edges can be cleaned. A little water makes us really smooth. Then we have to wait for another three to four days to dry some more. That sounds so long! By now, we are solid enough to move to the next stage. Edwin piles us up inside the oven where we’re baked for about 3.5 hours. The oven is really hot, like, 1,380-1,450 degrees Fahrenheit! We stay there overnight to cool off slowly so we won’t crack. The next morning, Edwin opens the lid and lets us finish cooling. We don’t want to burn anyone! It’s time for my favorite part! I could have been painted orange or white, but I got lucky. Instead, I’m painted my favorite color--a cool turquoise. Once I’m all dry, the creative painters use fine brushes to make bold flowers and multicolored dots, or “confetti,” on me. Now, I’m bursting with joy and feel almost ready to bring more fun into the world! There’s always something that needs a little more love and attention, so quality checks are in order. Either my brother was ticklish or my sister had to sneeze, so Edwin and his helpers take their time to make sure we’re all perfect and well-embellished before we get bathed in a shiny coat of varnish. Then, they let us chill out and dry for about five hours. For the finishing touch, Edwin blends his own gold paint so we can be extra fancy! Sure, all of our patience and his attention to detail have paid off, but man! With our shiny hooves, ears, and tails--I can’t help but admire how spiffy we look. Don’t you think? Now I know I’m ready to grace your tree. Let’s have fun!